Description: Shropshire. A decorative map from the second edition of Speed's seminal atlas, 'The Theatre of Great Britaine'. Showing vignette of Shewsbury. Description: Rare Latin Edition county map of Shropshire with inset town plan of Shrewsbury and vignette of the Battle of Shrewsbury (1403) . Original colour. 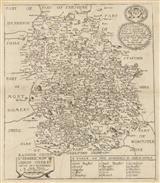 Description: Early county map of Shropshire taken from Christopher Saxton's survey and engraved by William Hole for William Camden's "Britannia". Coloured. Description: Shropshire. Decorative county map with early topographical detail of the Shropshire Hills, presented in fine original colour. Text on reverse. 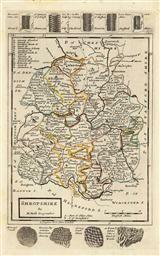 Description: Striking early map of Shropshire based on the surveys of Speed and Saxton. The dedication on the upper right is to Francis, Lord Newport, who would later become the 1st Earl of Bradford. 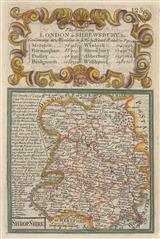 Description: Attractive county map of Shropshire after Saxton and with corrections by Philip Lea, decorated with coats of arms, ornate cartouche and inset plan of Hereford. Published by George Willdey. Coloured. Description: County map with text and table of distances between towns. Coloured. 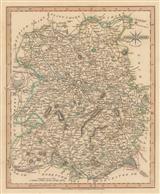 Description: County map with borders illustrating local antiquities and geological phenomena. Original colour. Description: County map of Shropshire with towns, parks, and major roads marked. Large decorative title cartouche. Coloured. 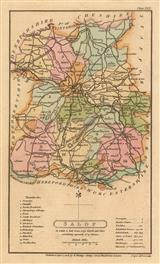 Description: Map of Shropshire with several panels of text detailing facts about the counties towns, history and peoples. Original colour. Description: Beautiful example of Georgian Shropshire with an extensive road network and wonderful topographical detail. Original colour. Description: Attractive map of the county of Shropshire highlighting the developing road network during the Industrial Revolution. Original hand colour. 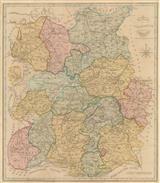 Description: Shropshire, a detailed and attractive county map published in the early 19th Century. Original colour. Description: County map in original colour. 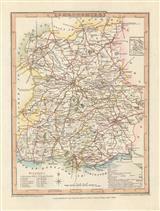 Description: Elegant and detailed county map with a compass rose and subtle original colour.